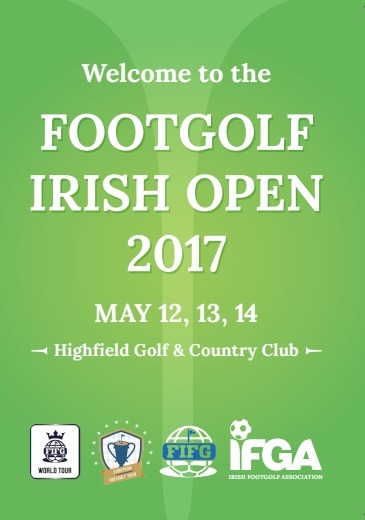 – Live Draw on the FootGolf Ireland facebook page, 6pm GMT. – Course open for practice from 5pm (€10). – FREE Practice from 9am until dark. – Pairs Competition will begin at 3pm and will run until the Top 6 pairs are left. – First tee time at 9am sharp with flights running every 10 minutes. – 30 minutes after the final flight completes their round, the Semi-Finals & Finals of the Pairs competition will take place. – Buffet Dinner & Drinks from 7pm. – First tee time at 8:30am sharp with flights running every 10 minutes. – Irrespective of player scores from Day 1, flights will be arranged as per Category entered, with the leading players in each category playing in the last 3 flights.